Deputy Chief Minister, Chowna Mein also hold a high level meeting with the Parliamentary Secretary for PWD, Techi Kaso, Chief Secretary, Satya Gopal, M Riten Kumar Singh, RO MoRT&H, Itanagar, Bilatee Pertin, Commissioner (PWD), Toli Basar, Chief Engineer (Highway) and others to discuss the issue on Potin to Pangin Trans-Arunachal Highway this evening. He said that the Potin to Pangin road is one of the very important road of the State as it serves as the life line for the people of five districts namely Lower Subansiri, Kamle, Upper Subansiri, West Siang and Siang. Narrating the plights of the road, he said that the said portion of road is in deplorable condition as it remains unattended and unmaintained for the last four years causing hardships to the people due to which there is public outcry. He informed that the road has been handed over to MoRT&H by the State PWD long back in the year 2014 after the later assured its maintenance and widening. However, due to many issues including land compensation and others, the road widening and construction has been over delayed and could not be taken up by the MoRT&H in time. 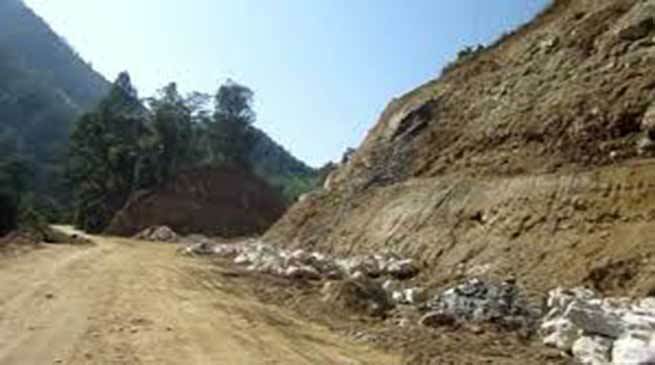 He asked the Regional Officer, MoRT&H Itanagar to carry out repair and maintenance of the said road from Potin to Pangin in urgency before the onset of the monsoon to which the RO readily agreed to convey the message to the Ministry and to carry out the repair and maintenance of the said road in patch wise manner. Chief Secretary, Satya Gopal said since the road has been handed over to the MoRT&H by the State PWD it is the duty and responsibility of the MoRT&H to maintain the road and asked the RO MoRT&H to give a time bound action plan for repair and maintenance of the said road before the onset of monsoon. He said the non-maintenance of the road is causing inconvenience to the people and hampering economic development of the region. Meanwhile, M Riten Kumar Singh Regional Officer, MoRT&H Itanagar said he is always there to help and give assistance to the State Govt in maintenance and improvement of road networks in the State.